Daily Diary - Pictures and information from each day's ride will be posted daily on the Katy Trail State Park Facebook page. The 16th annual Katy Trail Ride, June 20-24 allows bicyclists to experience Katy Trail State Park from St. Charles to Clinton. Missouri State Parks and Missouri State Parks Foundation invite you to join them on this scenic five-day ride on the nation's longest developed and most popular rail trail. Check-in for advance shuttle riders will take place in Clinton from 8:30 a.m. to 9:30 a.m. and in Columbia from 11:30 a.m. to 12:30 p.m. Sunday, June 19. Packet Pickup will be at the ride information booth at Frontier Park in St. Charles between 3 p.m. and 9 p.m. on Sunday, June 19 and between 6:30 a.m. and 7:30 a.m. on Monday, June 20. Registration packets can be picked up at this time. The packet will contain your official rider tag, map booklet, t-shirt, water bottle, etc. Written cancelations e-mailed or postmarked by May 16, 2016 will receive a refund, minus a $50 cancelation fee. No refunds, for any reason, will be made for cancelations or no-shows occurring after May 16, 2016. Cancelations can be sent to katytrailride@gmail.com or Missouri State Parks Foundation, 201 W. Broadway, Suite 4C, Columbia, MO 65203. For an additional $70, you (plus your bicycle and baggage) can be transported on a comfortable air-conditioned motor coach from Clinton to St. Charles on Sunday, June 19, or after the ride on Friday, June 24. Round-trip transportation from Columbia to St. Charles on June 19 and from Clinton to Columbia on June 24 is available for $120. Advance Shuttle = Board motor coach at Clinton on Sunday, June 19 and be transported to St. Charles for start of the ride. Return Shuttle = Board motor coach at Clinton on Friday, June 24 and be transported to St. Charles after the ride. Round-trip Shuttle = 1. Board the motor coach at Columbia on Sunday, June 19 and be transported to St. Charles for the start of the ride. 2. Board the motor coach at Clinton on Friday, June 24 and be transported back to Columbia. 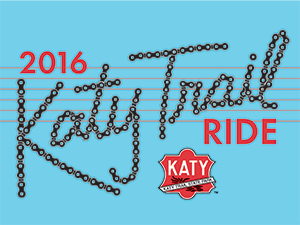 All participants will receive a 2016 Katy Trail Ride t-shirt as part of their registration. Additional t-shirts may be ordered separately for $20 each. 2016 Katy Trail Ride is geared toward the intermediate cyclist. Good physical conditioning will make the ride much more enjoyable. The ride will cover 241 miles in five days with daily mileage ranging from 37 to 64 miles and can be very strenuous. All riders will be expected to complete the ride each day except for true emergencies. Before the ride begins, ride as many miles as possible and ride as often as your schedule allows. Long rides of 40-50 miles are important, as are a series of back to back rides. You should experience cycling in all types of weather and on similar surface terrain as the Katy Trail. June weather in Missouri is unpredictable. It may be hot (in the 90s), humid, windy, rainy or cool at night. Weather conditions can make even the shortest days more challenging. The surface of the Katy Trail is packed crushed limestone. Mountain bicycle and hybrid bicycle tires are best suited for the trail. Here is how you can sign up to help with the 2016 Katy Trail Ride! Fill out the Volunteer Form by Friday May 6. You should get a call no later than May 13 confirming your volunteer assignment. If you do not hear from us by then, please call 573-449-7402.